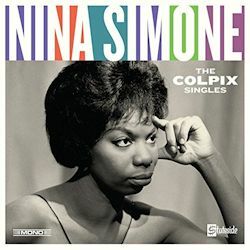 Nina Simone recorded 27 singles for the Colpix label between about 1959 and 1963 before leaving the label in 1964, by which time she had made her mark. The singles may well be less well-known than the albums she made for the company but these 7” tracks, released as 45s, reflect her journey from the full-on, rather gauche backing to Chilly Winds Don't Blow through standards like Summertime and Fine and Mellow to Blackbird which presaged her political activism. Many of the tracks will be familiar from the live Colpix albums of which they formed part but it’s salutary to be reminded of which songs the label thought would do well. It also, coincidentally, charts the prevailing winds of American popular song just before the arrivals of The Beatles. Her backings were perfectly adequate if sometimes a little generic and swoony, as in Solitaire or purely gauche in the case of If Only for Tonight. Otherwise some of the later songs were the work of the ever-excellent Ralph Burns and the earlier ones were arranged by such as Bob Mersey and Stu Phillips. Simone was still recording things like Children Go Where I Send You which was a pop arrangement of a Spiritual but also essaying Willow Weep For Me an altogether better vehicle for her talents, complete with muted trumpet obbligato, flute solo and semi-audible vibes. She sounds very much like the Simone of her best years – loved or loathed according to taste – on The Other Woman with its stripped back piano accompaniment; her own I assume. Taking on Fine and Mellow and not sounding like Billie Holiday is a real achievement and she is suitably moving onSince My Love Has Gone whilst she gets bluesy hues into Under the Lowest, heard here in the short 7” version. There’s also the Bessie Smith legacy to consider. She takes a determinedly up-tempo view of Nobody Knows You When You're Down And Out and a more conventional one of I Want A Little Sugar In My Bowl which the notes and track listing, for some strange reason, claim is a Simone song. You Can Have Him, with its complex play of emotions, is a highly persuasive example of her art whereas its more ephemeral aspects, such as the lame Ray Charles take-off, Come on Back Jack, are probably best heard in context. She takes on Ellington’s I Got It Bad (And That Ain't Good) where her fruity vibrato, nannying and oscillatory, makes its first extreme appearance. If you know Nina Simone at Town Hall and her Newport and Ellington albums you’ll know the singles here that were extracted from those albums but as noted earlier it’s revealing to see Colpix’s reportorial decision-making at work when it comes to releasing singles. The remastering is excellent, and the booklet notes good. What could have fitted on one CD spreads across two, with the result that this is a gatefold twofer.